oh this is sweet ! and he is smiling toos !! Remove the turban and give him round spectacles, you have a Gandhiji there. 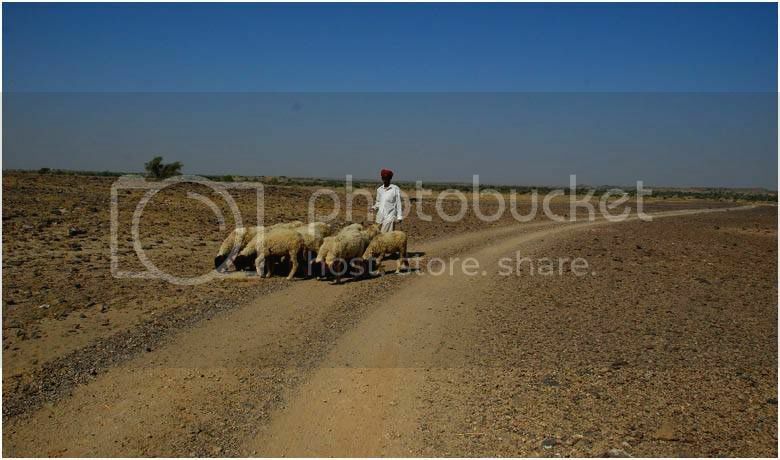 He is a shepherd, they all wear Jewelry. Long before it became fashionable for men. i think Gandhiji's ears were pierced too. not sure, have to check. He has problem with his eyes, i didn't notice while taking pictures, i am half blind anyway, i don't notice things. They are poor people, Even very poor are obsessed with gold in India. Does he go to school ? i used to feel sad about it, but not anymore, i had a useless education, this boy is learning how to survive in the desert and i can't. Geometry, world war one, world war 2 are so useless. 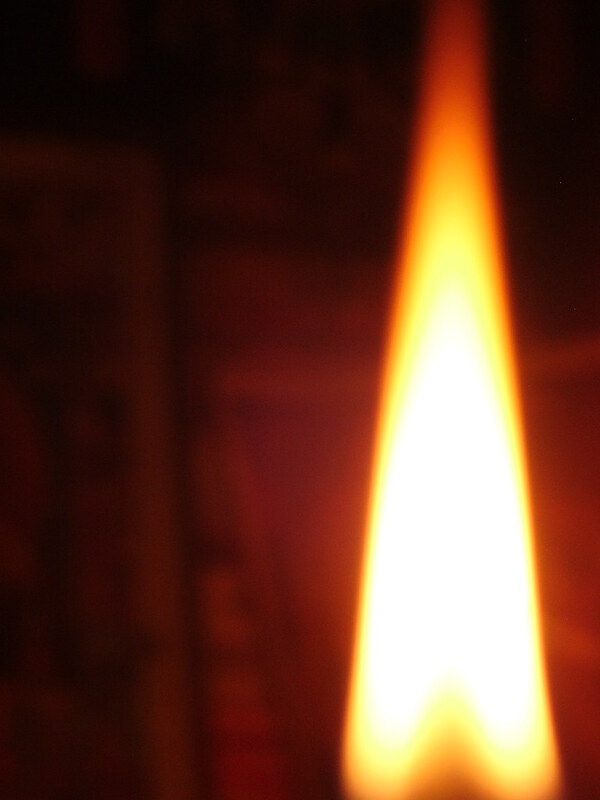 But we repeat our blunders, whats the point in learning our history ? 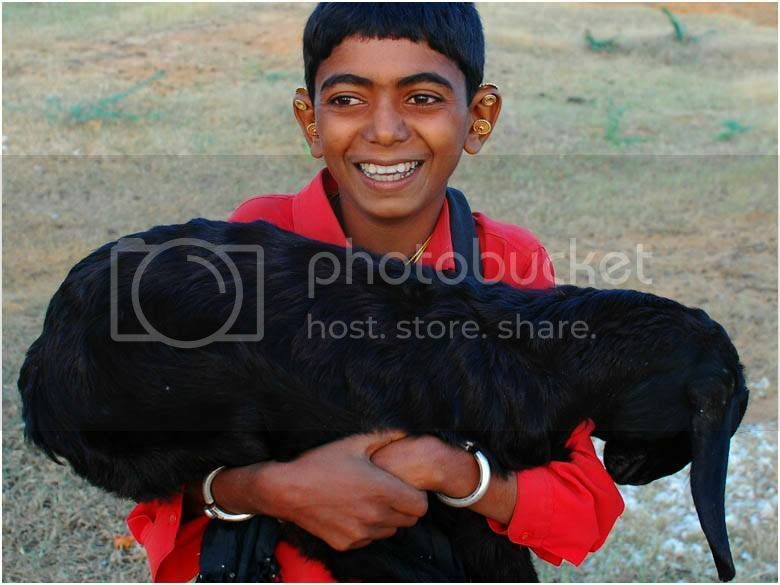 Another shepherd, he is wearing tiny ear rings. that's how i missed many trains. gorillas don't wear turbans ? What would i do with Jewelry ? How about hanging a couple of carrots down my ears, i can always pluck and eat them when i am hungry, a bunch of grapes the next day ? Like always i am sitting by the road side and eating hot jilebees. Sweet they are. 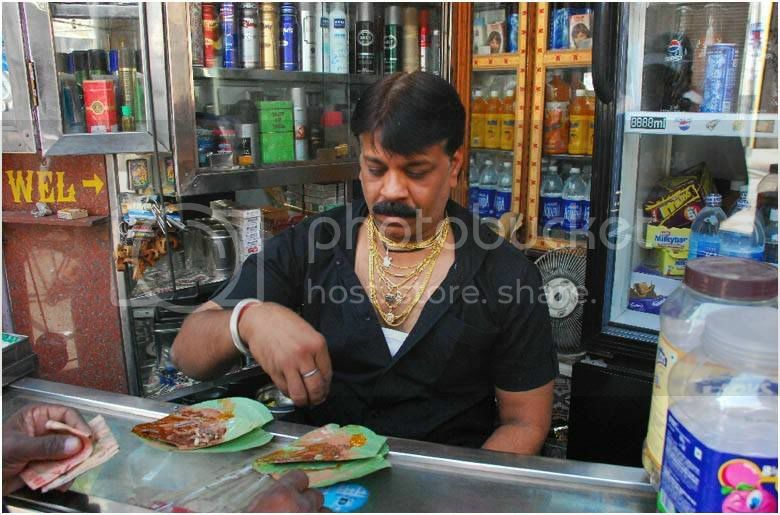 He is making PAAN for us. Well, what IS paan ? Aaartidee yenge' dee Nee ? please explain. oh ! look at the stuff he is wearing ! wow ! deah o deeeah ! This is fantastic ! why are you shy about it ? You look like a movie star sir ! Yea yea ! they pulled the wrong tooth in a hurry ! no no that, is my mischief, i painted the tooth in photopaint. 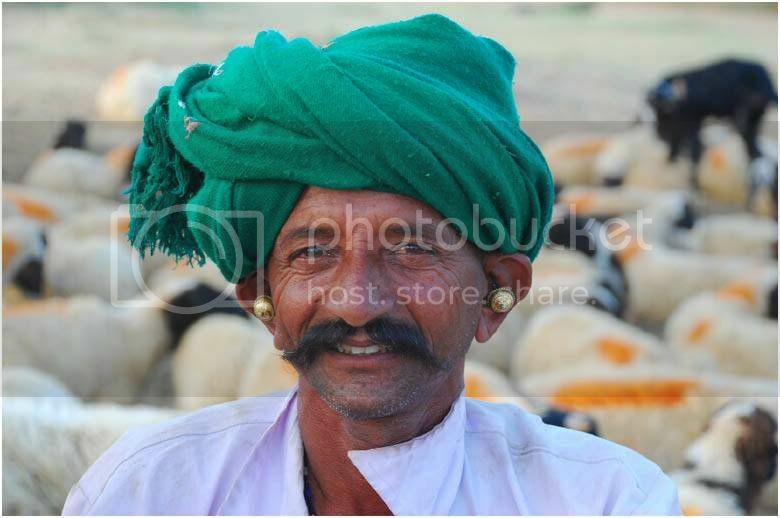 I think Sam Elliott would fit in with these fellows, have never seen him in earrings, but his mustachio is all set. Made using betel leaf, diff spices, sweet n tangy sauces..all rolled up= paan!! chk this out if u wanna know more!! the Vonly thing i hate is people chew chew chewing on this and then spitting out red liquid..eeeks!!!! btw, cool pic of urs...sema smart..wat u eating yaa??? It's good to see you, Rauf! And your pictures are awesome, as always. I always feel joy and learn when I look at them. lol,so Gujju :D should show my Gujju frnds :D HA you look very wise :D wiseana wisea? Such colorful photos of colorful people, Rauf! The gold earrings are amazing. 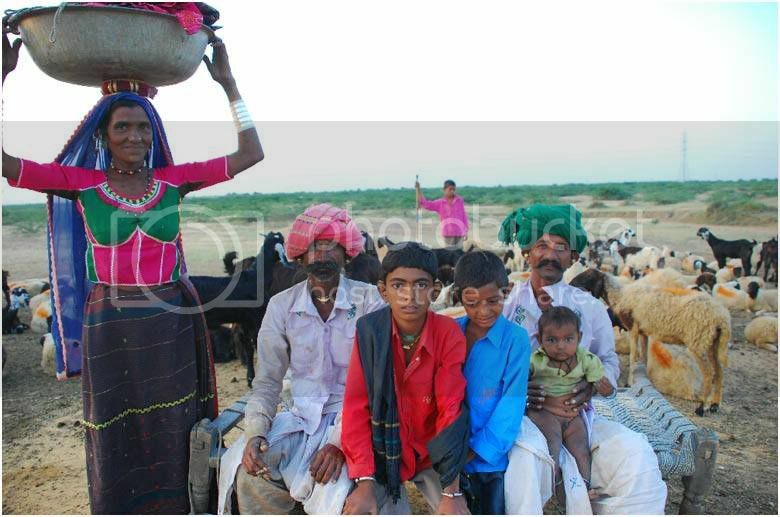 Such a good and colorful villagers and their photos. 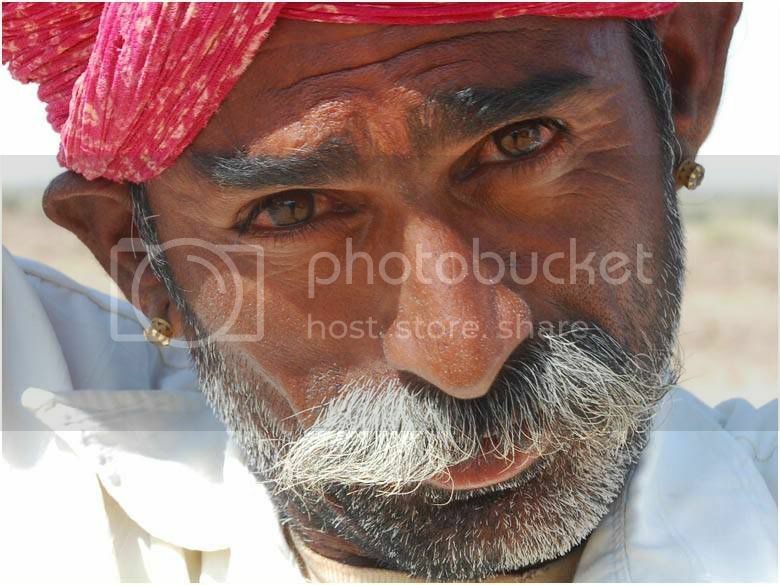 Rauf, you've a knack of capturing emotions :) Wonderful pictures. So I did a little Googling, like I often do after reading one of your posts, Abi. 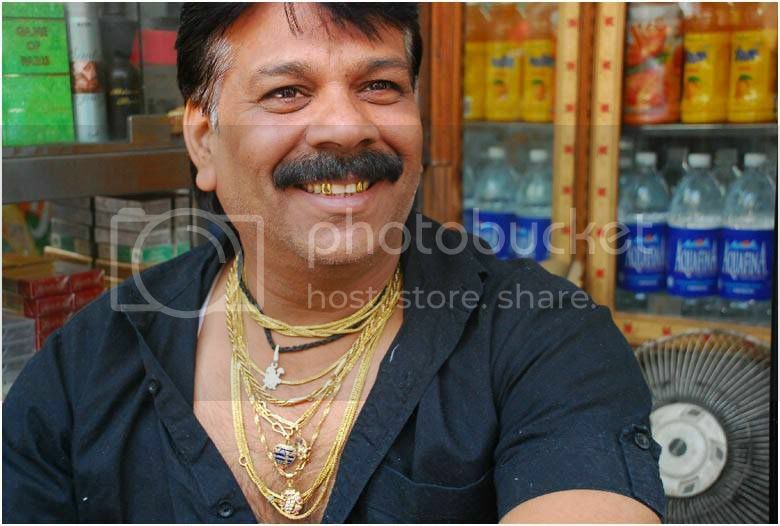 Googled "india men jewelry" - and hey, your post showed up on the first page. I also found a couple of other sites of interest. This one talks about the significance of the ears and wearing earrings in Indian cultures, mostly about the spiritual significance, and mostly about women. 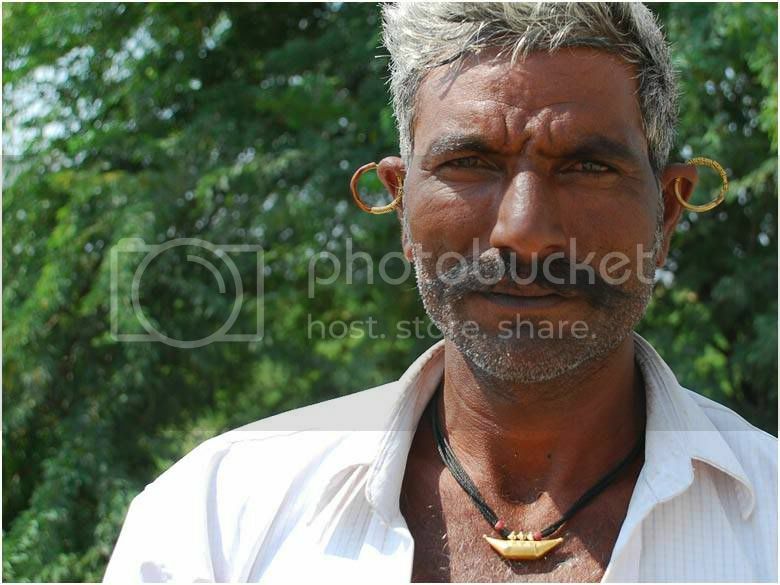 And then this one that talks about Indian men wearing ear studs nowadays, "Men in India have worn earrings through the ages -- Rajputs, Gujratis, kings and Hindu gods are always depicted with their danglers." 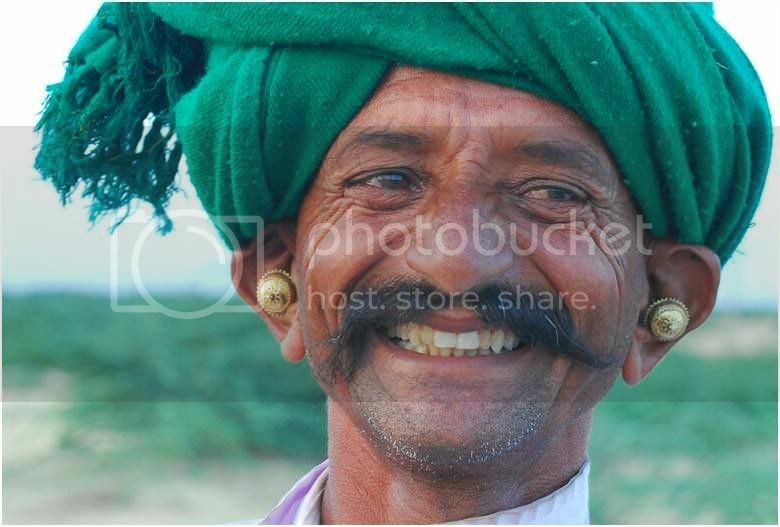 I wonder what the history of Gujratis wearing earrings is! Sorry, rauf, I'm such a nerd. :D But see how your posts peak my interest? 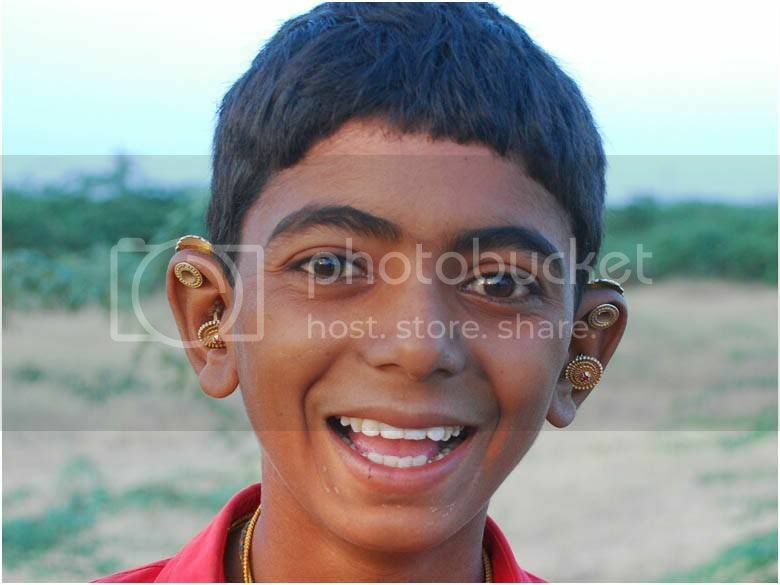 Oh, and the poor guy whose teeth you blacked out, he's got some good Buddha ears, no? Shows good spiritual development, apparently. But all necklaces and gold teeth, no earrings on him. 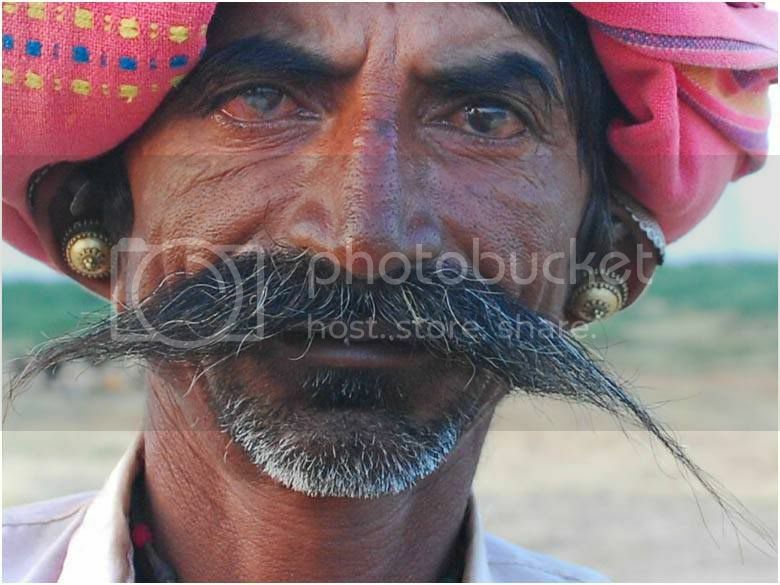 Those are some spectacular moustaches you have photographed, Rauf! Very impressive. M. Poirot would be jealous, I think. And is that really you in that photo? Does not look like a gorilla to me - looks like a very friendly man with a great big smile and bushy bushy beard. is that a photo of you...so nice to see you! Wow...earthy,rustic and colorful..loved them..and the man with tiny ear rings actually had the most villainous look in the collection..reminded me of nana patekar. 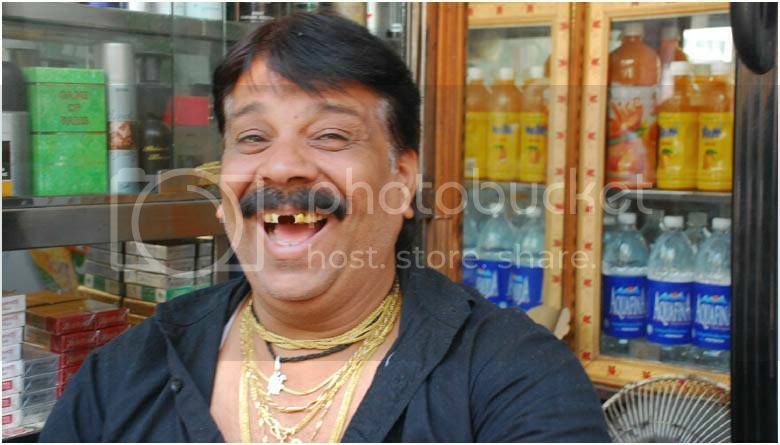 And the man eating jilebis was having a great smile which can beat any gold jewellery :). A macho post! with beautiful pictures. 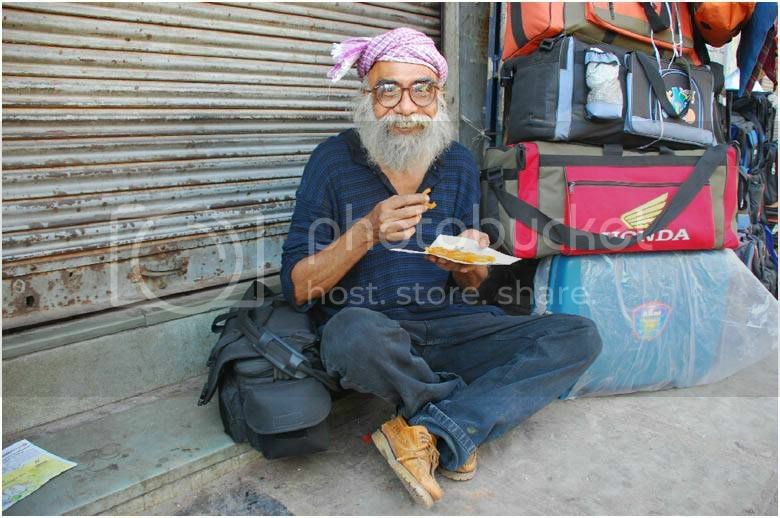 Rauf Uncle! That was a fun collection of photos! 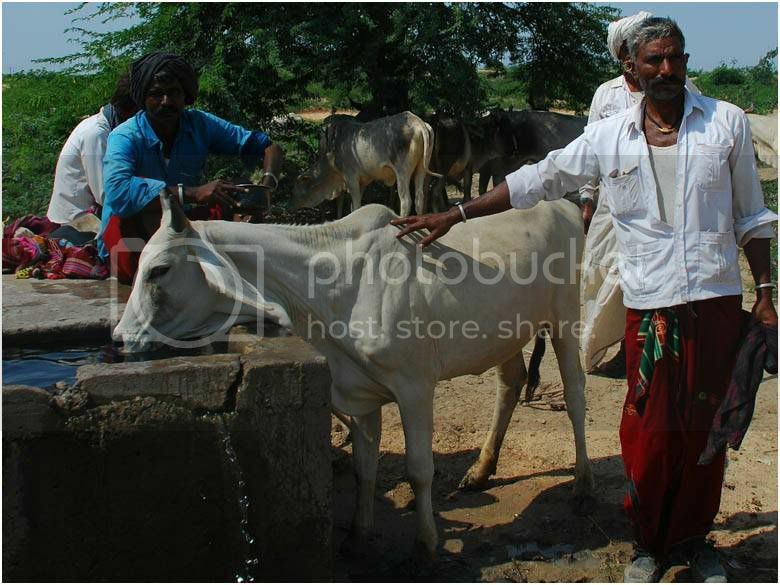 And the 2nd pic - doesn't that cow look a little like a cross between a cow & a horse?? :-? Rauf it has been a while! Glad to see you have beautiful pictures as ever. You always seem to capture such earnesty. Makes me think its there for all of us to see, we just dont stop to look. 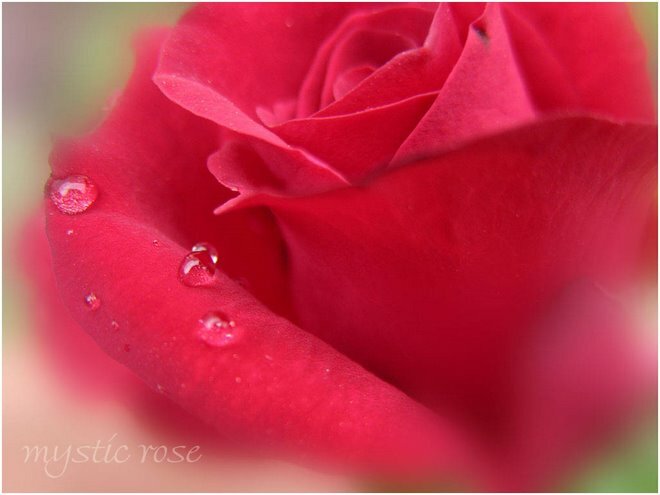 And for that, I am grateful to you, for freezing moments for me :) To remind me to stop and look! I am glad to see you! You look very nice! Great post! 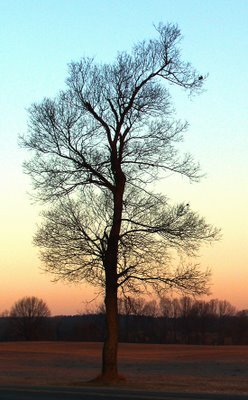 Love your pictures, they are gorgeous as always! I hope you have a nice week ahead! please,please,please update ur blog.i know u have a lot of stories to tell,wonderful snaps to post and intelligent thoughts to share.u r such a joy! soz I haven't been around lately. I used to have both ears pierced myself. On the left an anchor - which with hindsight is a worry - and on the right a diamon stud which some bird nicked in '84. Glad you're ok old bean. If you haven't a pot to piss in you're my brother!!! Not robots by the way. Just going very slowly and painfully out of business. Wonderful report ! Well done ! You are funny.. Understanding humor and having wit is the surest sign of great intelligence.. so you're not fooling me!! !Mr Smart guy!! I loved seeing all these photographs and you are so cute!!! Now don't blush!! Now before you pointedly remark on my earlier comment, let me say that most times the only thing I can do when I read one of your posts is smile happily, and it lasts the rest of the day. You are indeed cute. but you have lost a lot of weight, I feel. Lots of love and please take care. Cool pics-this place in computerland always astounds! lovely pics i must say!!! Fantastic set of photos. 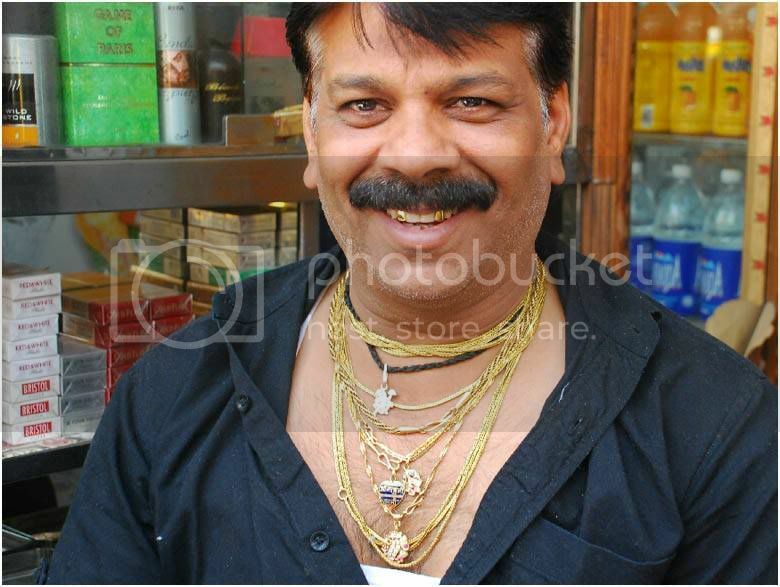 As for the jewelry - if you've got it flaunt it! a lot of very good portrait ! Hey.. Hi.. 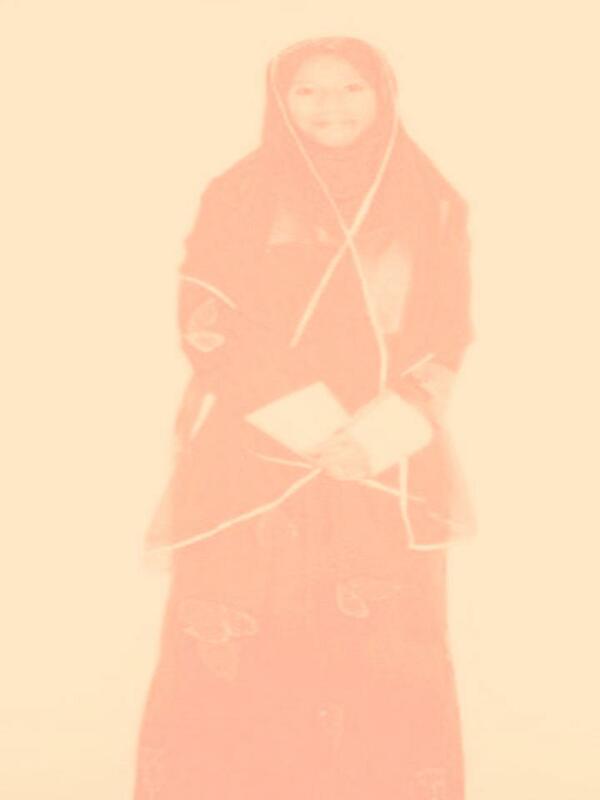 This is Sandhya.. R'ber?? I met u in train.. How r u?? Happy New yr..
its been so long RUTH, that i forgot how to respond to comments. no comparison with Sam Elliot. For these guys a woman is nothing more than a baby making cleaning cooking and washing machine. EEEEEEEEE AAARTIDEE, thanks for the details, now i forgot where all i went. i think i get very lazy when i get back home, responding to comments after months, i can offer no excuses. Thanks CLAUDIA, Hope you and Children are enjoying the holidays. PRIYA, actually these guys make a lot of fun of us, the people from the city. We are weird for them. One of them really felt sorry for me, rightly so. i don't know how to survive in extreme conditions, i do not know how to grow my own food. they do. Surprisingly JUDY, these guys go to the goldsmith and they are specific about what they want, some of them give the designs. RUTH, Jewelry is more than passion here in India, its religious. Gold is offered to Pujaris, teachers, not poor school teachers but music and dance teachers. Since the kings wore all kinds of jewelry the subjects were not far behind even the poor ones. Piercing the ears is a religious ritual followed by a feast. SEW, Hercule Poirot is proud of his moustache. Here in India it goes beyond pride. Its just a silly unwanted growth on the face. they don't mind losing hair on the head but not their moustache. 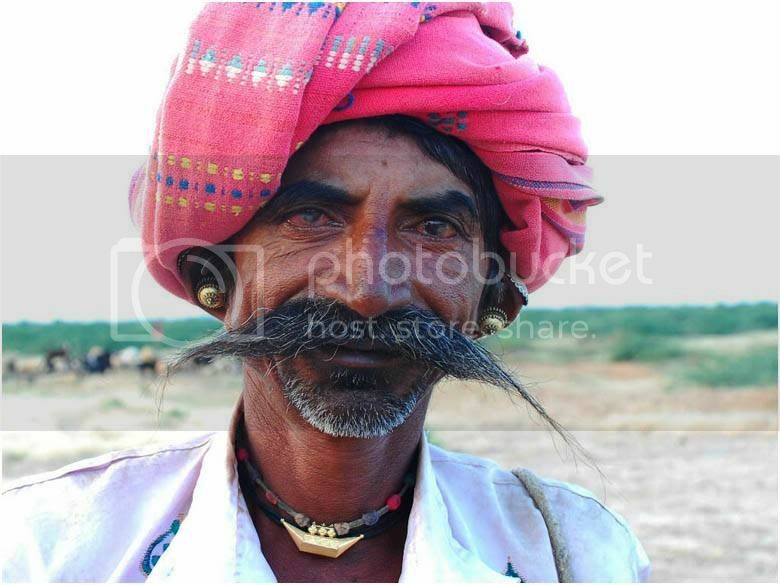 A Couple of Indians were in the guinness book for the longest moustches. They grow and stickit on their cheeks in circles. Yuk ! Thank you SANDY, people with impressive moustaches (even dreadful looking) are preferred for security jobs. if i look for a watchman i'll choose a guy with most impressive moustache. hahaha NAUTANK NATWARLAL, never heard that story. i played a role of a chor swamiji, they gave me additional moustache which kept falling. i already have a wild growth on my gorilla face. i rejected it. it had a clip but it kept falling. the play was in Tamil. i insisted on no dialogue, all i had to do was bless my devotees and take money from them. It was conducted in museum theatre perhaps long before you were born. i was given a saffron veshti which kept falling toos. i said give me veshti or give me moustache, i can't handle both.